The route goes along the chimney from the left end. Bridging tech.. The route goes along the chimney from the left end. Bridging technique. Unbolted route. Some nuts or friends may help. Crux just before lower-off. Bridging technique again. The lower-o..
Crux just before lower-off. Bridging technique again. The lower-off consists of an old screw gate carabiner. Exposed start. You need good foot technique and balance moves to .. Exposed start. You need good foot technique and balance moves to climb the first section. Continue slightly to the right over a small wing and then upwards to the lower-off. Balance moves on a sustained route. You need well trained fingers..
Balance moves on a sustained route. You need well trained fingers to climb this route. Same lower-off as Flash Clasic. This is the reference route for the 6a grade in the area. Very w.. This is the reference route for the 6a grade in the area. Very well bolted. If 6a is your maximum grade, try to climb this on-sight! You will find very good pockets on the route. The crux is a long reach. Shares the lower part with Micul Septar. The route is rate..
Shares the lower part with Micul Septar. 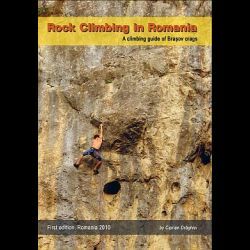 The route is rated 6b if you don't pull the pocket from Micul Septar. Before the wall ends, traverse to the right beneath the small overhang. This final move is very airy and you need good balance to complete the move. Easy start followed by balance moves. Hard to read the sequence. This route intersects with Fisura. Two finger pockets in t.. This route intersects with Fisura. Two finger pockets in the first section, then balance moves and friction climbing in the second part. Same lower-off as Cupidon. The main idea in this route is that you are not allowed to use th.. The main idea in this route is that you are not allowed to use the crack on your left, hence the name of the route (tentatia means temptation). A small overhang at the beginning of this route leads you on a le..
A small overhang at the beginning of this route leads you on a ledge where hard moves start. You need strong fingers (hence the name of the route) and good foot technique to succeed the climb. Enjoy one or two finger pockets on the route! This route is a variation of Body Building. The difference.. This route is a variation of Body Building. The difference is that you start climbing directly over the lower overhang, which makes the route harder. First part of the route consists of powerful moves on small foot ..
First part of the route consists of powerful moves on small foot holds. Then you will find a rest place. The second part has long reaches on friction climbing. Sustained and complex route. Powerful moves on one or two good fi.. Sustained and complex route. Powerful moves on one or two good finger pockets but with long reaches. The second slightly overhanging section is climbed using the friction technique. There are two variations of this route. The classic one increases.. There are two variations of this route. The classic one increases in intensity, with powerful locks on one or two finger pockets towards its end. The start is not difficult at all. The second variation which starts a little bit to the left (without making use of the dihedral) is estimated to 8a and it was not free-climbed yet. Small pockets in first part, then a rest place on a good pocket. ..
Small pockets in first part, then a rest place on a good pocket. The crux consists of crimpy and balance moves on a slightly overhanging section. Spectacular route featuring lock-offs on good pockets. Good rest .. Spectacular route featuring lock-offs on good pockets. Good rest position on big pocket shortly after start. Try to climb this route on-sight! The route follows the edge on the right of On Sight. Susta.. The route follows the edge on the right of On Sight. Sustained route, on pockets with finger jams. The route starts from the ledge at half-height of the wall. You r.. The route starts from the ledge at half-height of the wall. You reach there by climbing any of the routes which end on that ledge. Steep climbing on first section, then easy terrain. The route starts from the ledge at half-height of the wall, a lit.. The route starts from the ledge at half-height of the wall, a little bit to the left from Gauroaie. Fingery route. The route starts with a technical sequence on overhanging chimney.. The route starts with a technical sequence on overhanging chimney and continues on the steep face. Enjoy the jug before the top! Same lower-off as Gauroaie and Diedrul.